Bank of England Governor Mark Carney has said that developments around Brexit are the most significant influences on the UK's economic outlook. Governor Carney made his comments as he delivered the annual TK Whitaker lecture at the Central Bank today. Mark Carney said while the impact of the so called Fourth Industrial Revolution may be felt over the coming decades, some of the Brexit effects may be much more immediate. Mr Carney said the Bank of England is "well prepared" for whatever path the UK economy takes, including a wide range of potential Brexit outcomes. He also said the UK's largest banks are prepared for a disorderly Brexit but uncertainty about the economic outlook is holding back pay growth. "We have used our stress test to ensure that the largest UK banks can continue to meet the needs of UK households and businesses even through a disorderly Brexit, however unlikely that may be. "Our job, after all, is not to hope for the best but to plan for the worst." The Bank of England Governor had reportedly warned senior UK ministers yesterday that a chaotic Brexit could lead to house price falls of up to 35% over three years as well as spiralling interest rates. He also is said to have told ministers that the impact of a no-deal Brexit could be as catastrophic as the 2008 financial crisis, according to UK media. 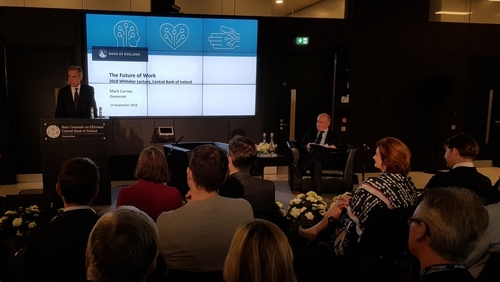 Speaking at the Central Bank today, the Bank of England boss also said that if the Fourth Industrial Revolution is similar to past technological revolutions, the overall effect will eventually be labour augmenting and will boost productivity and wages. It will also eventually create new jobs or maintain or even increase overall employment. But he cautioned that those outcomes will be in the long run and if the interim, it the revolution is similar to previous revolutions, it seems likely there will be a period of technological unemployment, dislocation and rising inequality. Answering questions from the floor, the Bank of England Governor said that given how open both the Irish and UK economies are, he expects the two economies to remain influenced by the global economy whatever form Brexit takes next year. He also said that big falls in UK house prices are not a prediction of what will happen but is what the UK needs to prepare for.